This is Part 3 of a 4-part series on the cultural impact of Social Media. Catch up here on Part 1 and Part 2. It’s no secret that we have a plethora of social media platforms available to us. The largest, Facebook, has a stated mission to “connect the world.” But there’s a fundamental difference between being connected and actually connecting. To connect the world is to supply the infrastructure — it’s laying the groundwork and building the roads and the highways. But equally important is getting people to actually use the roads. Social media is meant to bring us closer together — but it’s brought with it so much noise that we can barely enjoy its benefits. 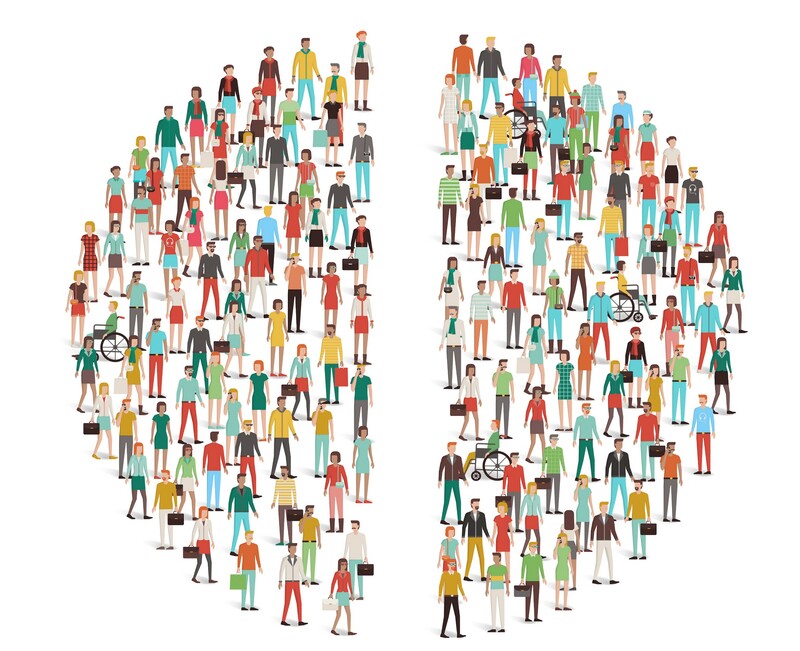 In this post, we’ll focus on community, and how the platforms meant to bring us closer together are actually driving us apart at an alarming rate. Scrolling through a friend’s new profile picture or looking at the post of a family member who updates their page a little too often doesn’t create a big divide. But social media has become a warzone for some of our most controversial — and unwinnable — encounters. Battles over race, gender, politics, religion, and many others are being fought on platforms not designed to enable complex conversations. Some topics need to be handled with care, and social media simply doesn’t provide the right platform. The problem starts with the structure of the platforms themselves — social media isn’t designed for conversations and discussions. Instead, it’s composed of mass broadcasting platforms where one person can say something and everyone else listens. When anything resembling a discussion occurs, the platform essentially functions as a debate forum. For example, when I post a picture, it’s similar to standing up in front of a crowded room and holding a big picture in front of all my friends who happen to be in the room at the same time. If one of them wants to say something about my photo, they can come up on stage in front of everyone and announce their comment on my photo. Social media is a stage where all communication is performed in front of everyone else. The debate-like structure is what causes the divide. It creates a method of communication where there is no grey area. You are either on one side or the other, and you have to stick with it. The Black Lives Matter movement on social media created a huge split between being pro-black lives or pro-blue lives — there was seemingly no middle ground. If you had tried to advocate for a middle-of-the-road point of view, you’d likely be criticized by both camps, creating the two-sided divide. Encouraging two different communities to argue in a broken debate-like platform creates an obvious divide. It doesn’t take long for the gulf to widen. For the most part, people post about topics prone to controversy because they feel very passionate about the subject. This usually means they are on one extreme side or the other. If you don’t feel particularly strongly about the topic, where does this leave you? Even though you might not really agree with either side, the side that you are least close to has likely been pushed so far to the extreme that it ends up pushing you further in the other direction. Take colors, for example. Say you like light orange. When you are given a choice between red and yellow, you’ll probably choose yellow. It’s closer to your preference — and red might be too bold for you. You ignore what you might not like about yellow, but see all the negative things about red. Soon, you might find yourself arguing against red — a more extreme view than you would otherwise have held. Oftentimes, the extreme version of what we believe pulls us towards it (yellow really is the best!) and the extreme version of the opposing side pushes us away (how could anyone think red is the best?). Remember, we were light orange fans when this all began. Of course, fights over extreme views on social media aren’t about color preference, but often about much more sensitive and important topics. These polarized debates bring us to what’s known as confirmation bias. Anything that “proves” the greatness of yellow or the inferiority of red will confirm how right we were to think that way in the first place. At the same time, we ignore anything that disproves or challenges our point of view. Our confirmation bias loop takes this further as personalization algorithms show us the versions of reality we want to see. We are presented with endless evidence to confirm our opinions. This was all less of a problem when news was curated and facts checked — but social media has allowed anyone to write about anything. As readers or viewers, we don’t check if sources are credible. Oftentimes, we won’t even read the article — we read the headline and think we get the gist. 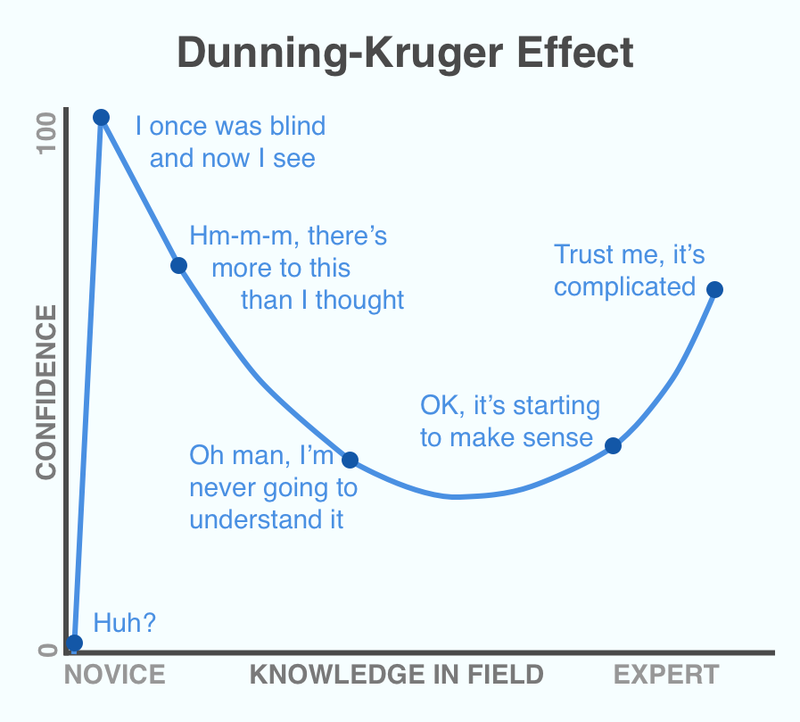 This is highlighted by the Dunning-Kruger Effect (graph below), which compares confidence in a given area with actual experience. We are living in dangerous times — where we don’t move past the first DK peak, “I once was blind and now I see.” We’ll read one article or one headline and think our eyes have been opened. We suddenly know everything we need to know and have the authority to talk about it. We are living in a world where we are instantly all experts in all areas and think that all opinions are equally valuable in all situations. Of course, this isn’t really the case. We wouldn’t give our friend advice on their upcoming heart surgery just because we once saw a documentary on surgery. So why don’t we do anything about this flawed platform for conversation? Once again, social media has trained us to observe rather than act. The public nature of our social media “discussions” make it incredibly difficult to back down once we get involved. We’re being watched by everyone — and would look like a fool in front of the whole tribe if we changed our opinion. We can’t change our minds or agree on middle ground, for fear of losing face. People don’t chime in because it’s just not worth it. We may have done so or seen others do so in the past, but we know those who are really passionate about one extreme side will keep pushing. Eventually, those who are loudest and most persistent end up “winning.” We have been trained over time that it’s best to just stick our heads in the sand and scroll until something more fun shows up. Racism, sexism, and general prejudice created by divided communities will continue growing while we keep using these mass communication platforms to replace real conversation. We need room for nuance, and for sharing thoughtful perspectives, and social media doesn’t provide this space. Without alternative platforms capable of satisfying our need for human interactions, our connected world will keep driving us further and further apart rather than bringing us closer together. We may be connected, but — increasingly — we’re not really connecting. Look out for the last post in this series that will touch on the biggest threat of social media — that it might actually be slowing down the progression of humanity.